Second albums can be tricky things, especially when the first one has been an artistic and critical hit. There’s enormous pressure to live up to expectations engendered by an initial success, as well as the desire to challenge oneself artistically with material that’s fresh and interesting. 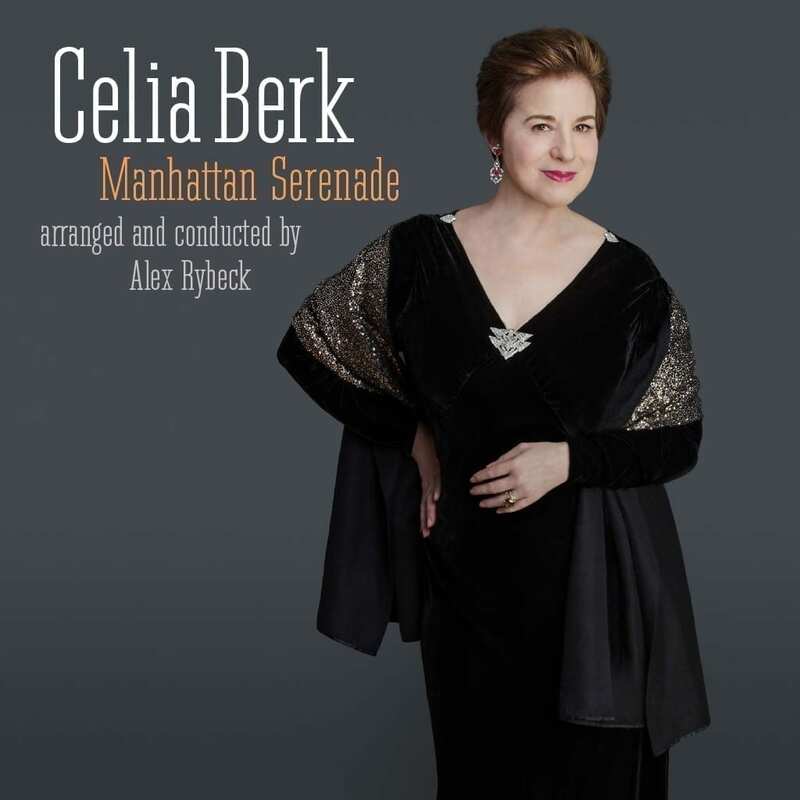 Perhaps not surprisingly, Celia Berk’s terrific sophomore effort, Manhattan Serenade, is a worthy companion to her smashing debut disc, You Can’t Rush Spring (2014), the recording that established Berk as a savvy new singer with style and substance to burn. If you’re lounging pool-side this summer with a pitcher of ‘something cool’ beside you, Manhattan Serenade should be downloaded on all your electronic devices! Berk’s approach to Manhattan Serenade and its eclectic collection of world-weary songs is an overriding playfulness that’s as unexpected as it is endearing. Her refreshingly understated style is perfect for “All I Need (Is One Good Break),” a forgotten ode to optimism from Kander & Ebb’s overlooked score to Flora, The Red Menace (1965). Previously a socko-boffo, knock-it-out-of-the-park number for Liza Minnelli (who sang the hell out of it! ), it’s given a stylish and sassy treatment courtesy of a spicy arrangement by musical director Alex Rybeck and a delicious orchestration by Jeffrey Klitz. Where Liza was desperate and determined, Celia is cool and methodical giving a terrific number an eye-opening spin. And that’s just the beginning. A smooth-as-silk version of Gerry Goffin & Carole King’s “Up On the Roof” leads to one of the hidden gems on Berk’s CD, “Seconds,” a song by – of all people – Burt Bacharach and Neil Simon. It turns out it was written in 1974 for an abandoned film version of Bacharach’s 1968 Broadway hit, Promises, Promises that never happened. Bacharach wrote it with Simon because his partnership with Hal David had ended and Simon, who’d written the book for Promises, wanted to try his hand at lyric-writing. It’s a strange, wonderful, obscure oddity with a classic Bacharach ‘sound’ that Berk makes her own. Traveling backwards in time to 1931 for a rollicking “Manhattan Madness” by Irving Berlin before giving a much-needed bluesy wash to Kurt Weill and Langston Hughes’ “Lonely House” from Street Scene (1947), Berk finally lands on a ravishing medley of “The Romance of a Lifetime” by Kurt Weill & Sam Coslow (written, but not used, for Fritz Lang’s 1938 film You And Me) and “The People That You Never Get to Love” by Rupert Holmes – an inspired pairing that brings out the best in Rybeck’s arranging gifts. For her part, Berk wraps the melodies of both songs in a luscious coat of wistfulness that gives the lyrics a nostalgic sting – albeit not a lethal one. The second gem – and this one would feel at home at Tiffany or Cartier – is “A Day Away from Town,” a delightful meditation on getting ‘out of the city’ written more than 75 years ago by Tin Pan Alley’s own Richard Whiting & Gus Kahn, with assists from Hubert ‘Tex’ Arnold (who harmonized Whiting’s melody) and Roger Schore (who personalized the lyric for Berk). Cleverly, it’s followed by Rodgers & Hart’s “I Gotta Get Back to New York,” an ode to the call of Manhattan, originally sung by Al Jolson in the 1933 film Hallelujah, I’m A Bum. Hart’s smart and witty lyrics find an ideal interpreter in Berk, whose sophistication and ease of delivery call to mind the late, great Mary Cleere Haran. “I Gotta Get Back to New York” also benefits from another terrific arrangement from Rybeck, this time with a superb, period orchestration courtesy of the great Larry Moore, who must officially be considered a ‘national treasure’ at this point. Berk’s disc concludes with the title song, “Manhattan Serenade,” by Louis Alter & Harold Adamson, “Spring in Manhattan” by Anthony Scibetta & Alice S. Reach, and the premiere recording of a new Cy Coleman & David Zippel tune, “The Broadway Song” from their musical collaboration with Wendy Wasserstein, Pamela’s First Musical. With a sensational arrangement by Rybeck and a sumptuous orchestration by Moore, Berk is the life of the party singing this love-letter to the Broadway musical, complete with a trio of back-up boys (the estimable Jeff Harnar, Joshua Lance Dixon and Kristoffer Lowe) and a pit orchestra about which singers can only dream! Manhattan Serenade is bookended with two intriguing rarities that reflect Berk’s ethos as a performer: simplicity, taste and daring. The disc opens with “Manhattan Hometown” by David Heneker from the short-lived 1984 British musical Peg (based on the 1912 play Peg o’ My Heart by J. Hartley Manners which starred his wife, Laurette Taylor, in her greatest stage triumph). In it, Berk sings of a longing for a big-town metropolis from the point of view of a small-town girl – it dazzles and delights her; she’s scared and she’s excited; yet she knows what she wants. Manhattan Serenade concludes, brilliantly, with Rodgers & Hart’s gorgeous “A Tree in the Park” from their radically inventive 1927 musical, Peggy-Ann. In this quiet and reflective reading of one of Rodgers most exquisite melodies coupled with one of Hart’s most devastating lyrics, Berk lets her guard down, if only for a moment. She’s reflective, she’s hopeful, but she also knows her wish is probably not to be. It’s a soul-baring interpretation that recalls Judy Garland’s shattering performance of “A Cottage for Sale.” Like Garland, Berk knows what the stakes are and she understands everything in life comes at a price. I can’t wait to hear what she sings next. Celia Berk performs live at The Metropolitan Room on: Wednesday, July 13, 2016 at 9:30 pm; Wednesday, August 3, 2016 at 7:00 pm, and Friday, October 14, 2016 at 7:00 pm.